National Ag Day is coming! Agriculture plays a key role in our world. Those involved in agriculture want to share our stories and help the public understand what we do. 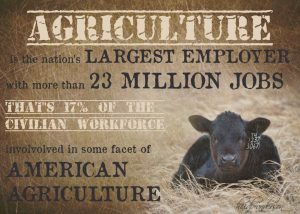 It is exciting to know that The Agricultural Council of America wants to dedicate a day to the industry of Agriculture. “Ag Day is about recognizing – and celebrating – the contribution of agriculture in our everyday lives. The National Ag Day program encourages every American to understand how food and fiber products are produced. Further, to showcase the essential role of agriculture in maintaining a strong economy, and finally, to appreciate the role agriculture plays in providing safe, abundant and affordable products. Agriculture provides the products we eat, use and wear on a daily basis. Regretfully, too few people truly understand this contribution. This is particularly the case in our schools, where students are seldom exposed to agriculture, unless they are enrolled in related vocational class. By building awareness, the Agriculture Council of America is encouraging young people to consider career opportunities in agriculture. As agriculturalists, we want to expand people’s knowledge about our industry, we want to share the pictures and stories from our farm; National Ag Day gives us a chance to do just that. We at Arps Dairy want to see your farm, we want to support you. Just as our farms work hard to achieve high standards for our products, we know most farmers do the same. Agriculture is a field of endless opportunities, and is always in need of new ideas and open minds. We hope that you Celebrate Ag and take part in National Ag Day. This information can be found at; (https://www.agday.org/). Please visit this site and engage in agriculture. Our world is changing, evolving before our eyes. It is due to this, we need to begin to see politicians, lawyers, doctors, and bankers as agricultural positions along with our foundation of livestock and grain producers. It is with this understanding, we, the young leaders involved in agriculture must share the knowledge that agriculture plays a large part in the overall workings of our world.